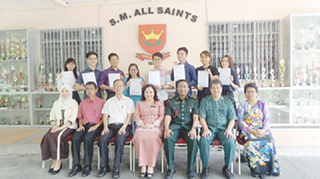 STPM: 24 SM All Saints students score straight As | Daily Express Online, Sabah, Malaysia. Kota Kinabalu: One of the oldest secondary schools here, SM All Saints, scored 100 passes in the Sijil Tinggi Persekolahan Malaysia (STPM) 2016 examination with 24 scoring straight As compared to only five in 2015.Its new principal Dr Mary Gambidou said the school has maintained 100 per cent passes for the past four years since 2013. She said 67 students who sat for the national exam also registered a 2.73 cumulative grade point average (CGPA) which emerged as the best CGPA outcome in the school's history since 2005. "The STPM 2016 result for the school was very encouraging and positive as the 2.73 CGPA was higher than the STPM 2015 result at 2.47 CGPA. Of the 24 top students who scored all As, three students were in Pure Science stream who scored above 3.00 while eight of 21 students in the Humanities stream scored above 3.50 and the rest above 3.00. "We only have one outstanding student, Newton Tham Vun Ket who scored 4As with a CGPA of 4.00 and overall, we are very proud of their excellent achievements as we have many top scorers compared to only five in STPM 2015," she said. Dr Mary said analysis of the school's STPM 2016 result also showed that in five subjects – history, visual art, physics, chemistry and biology – the school registered 100 per cent passes. She said history showed an improvement from 81.82 per cent in 2015 to 100 per cent in 2016 while biology was only 84.62 per cent in 2015 and chemistry secured 94.44 per cent in 2015. She said physics and visual art maintained 100 per cent passes in the STPM 2015 and 2016. The school attributed its excellent results to a three semester system that was implemented for students taking STPM in 2013. "The three-semester system helps our students to do well in the STPM as they are less burdened and tested on certain chapters of the subjects that are taught and scheduled for the semester rather than doing revision and being tested on all chapters as in the previous system. "Apart from that, the new system provides opportunities for the students to improve their marks as only the best scores are counted for their CGPA where they can choose to repeat the test in order to get better marks." Dr Mary said the school will also continue extra classes for the students taking the STPM this year including the mentor-mentee drive where students who do well in certain subjects will become mentor or tutor to help other students who are weak in those subjects, and answering past questions of STPM, among others.